Bringing water to those who need it most is no simple task. With a determined spirit and the right equipment, developing countries across the globe are tapping into the physical, emotional and economic benefits that access to clean water provides. Little Beaver’s Lone Star Drills are proud to provide a viable, economical solution to water well drilling. Commonly used by missionaries for water projects in developing countries, Lone Star water well drilling rigs are designed for use in areas with minimal resources for transportation and operation. While portable, the drills still provide ample power and versatility to reach target digging depths in all types of soil conditions and rock formations. Lone Star mechanical drills are perfect for the most remote locations where travel may require packing light. Hydraulic drills offer added power to drill through tough soil conditions, including rock. 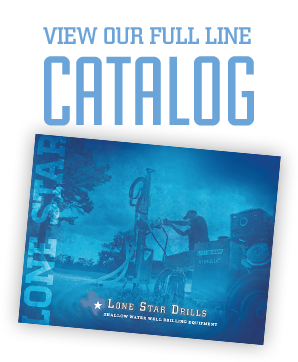 Lone Star’s Trailer Mounted Series of water well drills can easily be transported by ATV, provide more power and higher production rates and can drill to depths of 400 feet. Each water well drill kit fits into compact shipping compartments, in some cases a single crate, to allow easy and economical shipping anywhere in the world. Our drills are economically priced, with basic rigs starting at $5,000. Complete drilling packages start at $9,000 and include all the tools and replacement parts needed to ensure your project’s success. We offer discounts for qualified missionary and humanitarian organizations. Please send an email inquiry for a complete price list. Lone Star’s drills are an innovative addition to the Little Beaver product family. They are available in seven models and used in a variety of applications beyond water well drilling, including soil sampling, geotechnical testing and auger drilling. Join us on Facebook and tell us about your water well project.